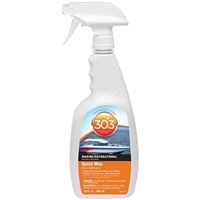 303® Quick Wax is the fastest solution for making your boat shine. This formula is a gentle cleaner that helps remove water spots, dust, and other debris from the hard surfaces on your boat. 32 OZ. Performance Boat Candy™ Speed Gloss™. 32 OZ. Performance Boat Candy™ Vinyl Clean™. 32 OZ. Performance Boat Candy™ Vinyl Condition™. Originally engineered for aerospace and aviation applications, 303® Aerospace Protectant has found its way into millions of homes for day-to-day use on vehicles, sports equipment, patio furniture accessories and more. Keep your boat,car,& trailer looking nice!